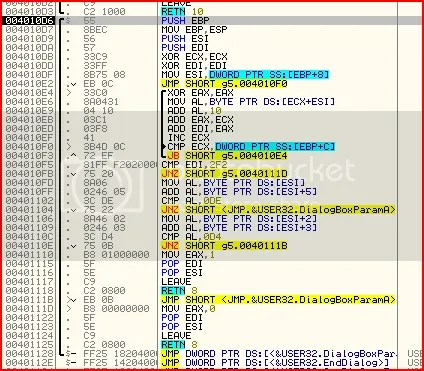 Attached to this thread is the target we are reversing today (g5.exe) and also the fully patched executable that makes it bruteforce itself (g5-Final Patch.exe). 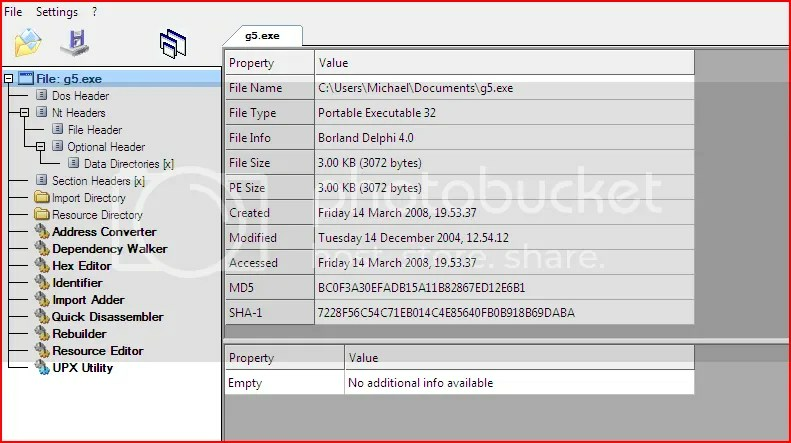 PEs or Portable Executables is the file format developed by Microsoft for executables, object code and DLLs. These executables are portable across all win32 systems. 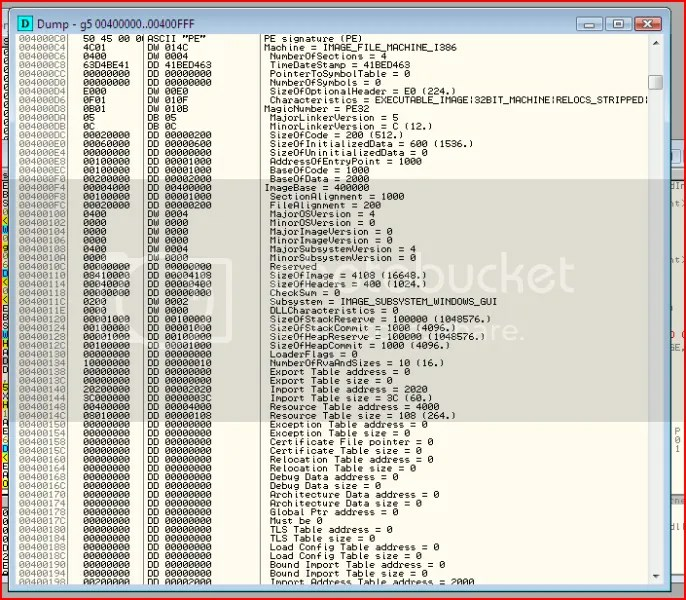 That is, the PE loader of every win32 platform recognises and is able to use this file format. I will be brief and will be leaving out parts that are less relevant to our purpose so it would be useful for you to do some reading up on PEs yourself. It is a vast subject and I will only skim over its surface. I will go through each of these parts elaborating more on the more relevant details. There is the string I mentioned earlier. When a PE is run in MS-DOS, the DOS stub is loaded. 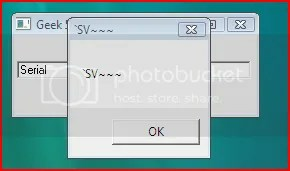 It often will simply display a string to notify the user a higher version of Windows is needed, or less commonly, an entire DOS program can be stored and executed from there. In our case, just the message is present. This points to the beginning of the PE file header. 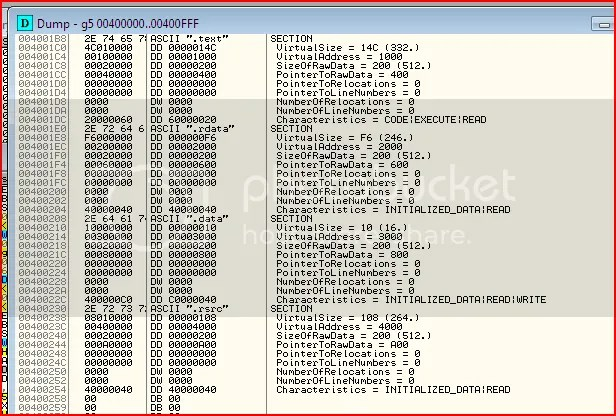 So a quick sum up, the PE loader examines the DOS MZ header for the offset to the PE header and follows the pointer. As you can see the signature is merely a dword with the term “PE” terminated by two zeroes. 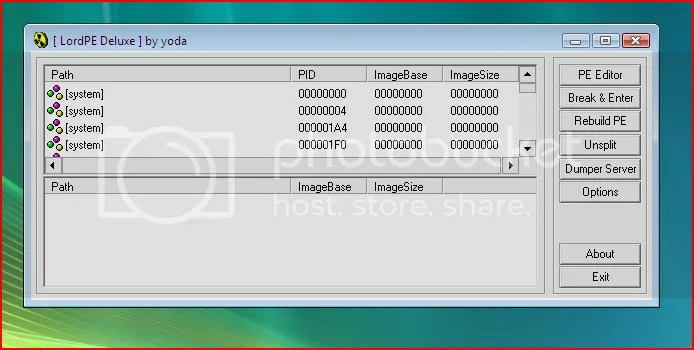 So if our image base address was 0x00400000 and an object was said to be at RVA 0x1000 then that object could be said to be at VA 0x00401000. 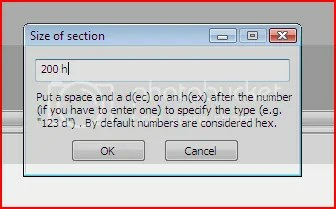 The PE header contains fields that are required by the PE loader such as information about the physical layout and properties of the PE file in general. 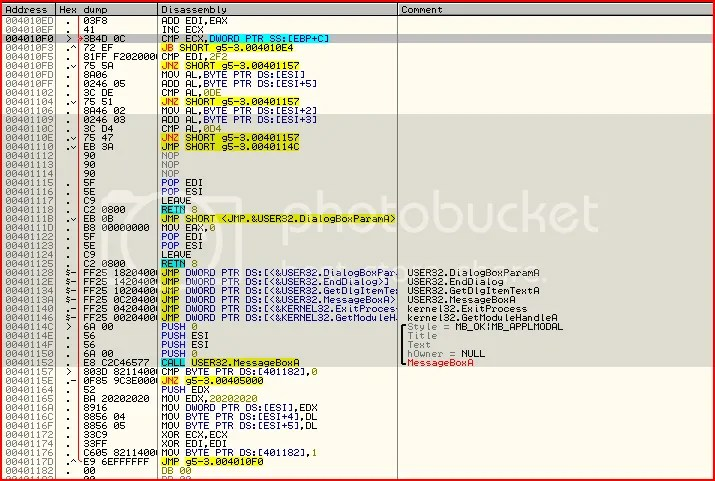 Notice the addresses are not linear/absolute but are relative to the image base (RVA). The PE header is usually located from [image base] to [image base+1000]. Not all the fields in there are relative to what we are doing today so I’ll explain them as we come across them/need them later. 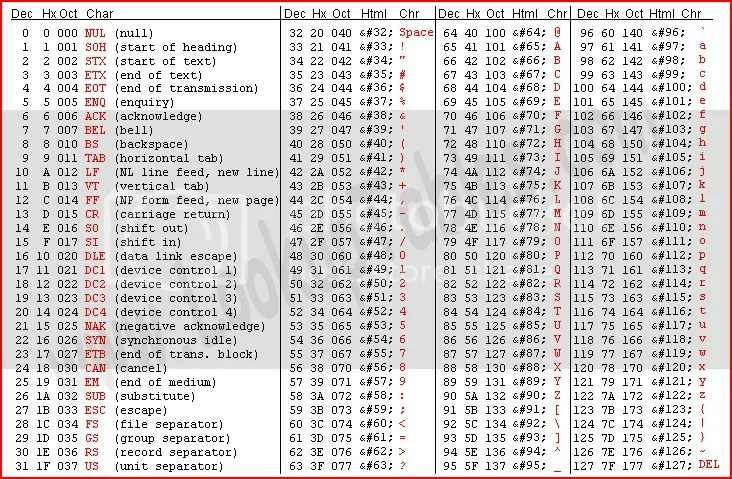 The optional header which contains more information on logical layouts within the PE file ends after this, immediately preceding the section table. The sections are one of the most important parts of the PE for you as a reverse engineer so pay close attention. 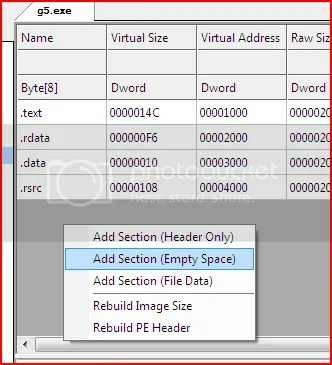 The section table lies between the PE header and the raw data for the image’s sections. Each section has its own corresponding section header. The order of these sections in the table is decided by their RVA. So sections closer to the image base come first in the table. Each section header is 40 bytes with no padding between the header for the next section. – Name = Pretty self explanatory. By default, a lot of compilers use section names preceded by a period. This is not necessary though. – VirtualAddress = The RVA of the section. 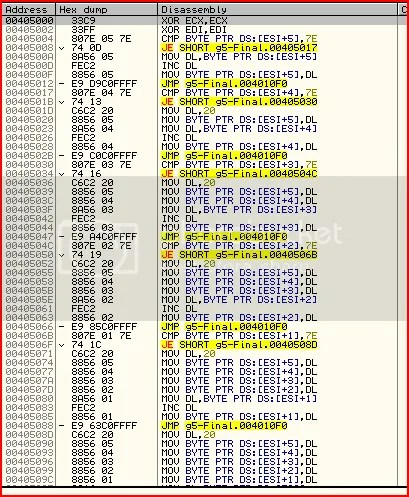 The PE loader reads this value and uses it when mapping each section into memory. 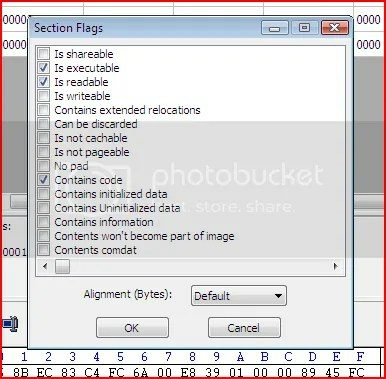 – SizeOfRawData = The size of the section rounded up to the next multiple of file alignment. This file alignment is commonly 200h. The size can be found in the optional header, in our case this is at VA 4000FC. – PointerToRawData = The file offset of the start of the section. 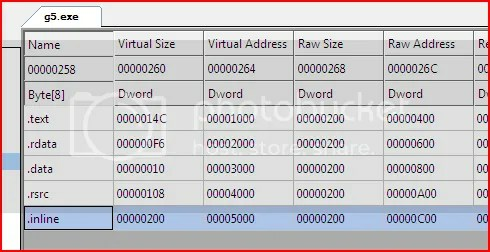 The PE loader uses this value to find where the data in the section is in the file (on disk). – Characteristics = This contains flags for characteristics of that section. Each of these flags have a value. The sum of all the flags that are set is written here, more on this later. The sections themselves also is something I will cover later. But what actually is a section ? 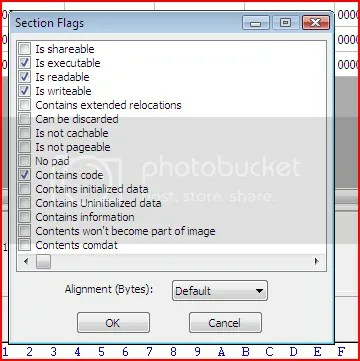 The content of a PE file is divided into blocks, called sections. 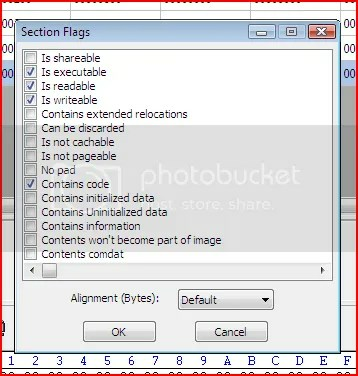 A section is a block of data with common attributes. These attributes can be code/data, read/write, these are the flags/characteristics I mentioned above. The data is grouped into sections dependent on their common attributes. As you already know, each of these sections has a header. The section itself is refered to as the body (raw data). Once each section is mapped into memory, it will have its own page. The second thing I want to talk about today is the memory stack. Before, you may have just thought of it as a sort of place where values were pushed and popped and sometimes work done on them, for example the arguments of an API call. I will explain a little about EBP and ESP and how they relate to the stack. As always, I will not go into great detail so it would be very beneficial if you went and read up on some of this stuff yourself. 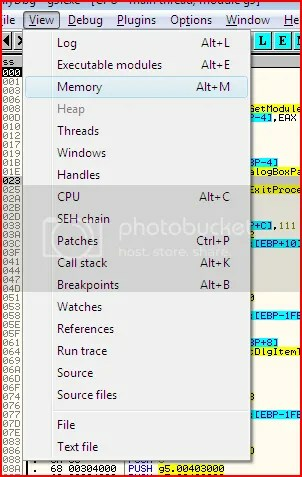 The stack is a writeable area of memory that has a dynamic size and gets bigger and smaller to accomodate its contents. In a process, a lot of the work is done in the stack so it’s important to have an appreciate of how it works. I mentioned some time ago about the way a process interacts with the stack. When the process pushes data onto the stack, the next data to be pushed is placed on top of the first one. This second data is the first one to be popped back off too. This is commonly known as “last in, first out” (LIFO). So how does the program keep track of where everything is on the stack ? The answer is in the two registers ESP and EBP. 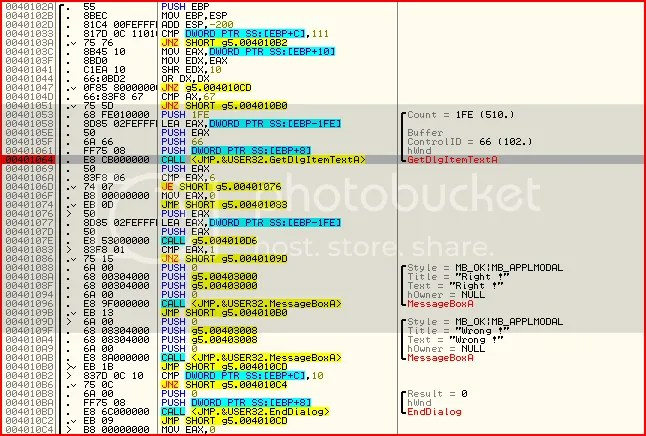 ESP always points to the top of the stack and EBP holds the memory address of the bottom of the stack, the base point in the stack. That is why you will often see stack data referenced by [EBP+*] or [EBP-*]. This instruction would increase the stack’s size by 8 bytes/a dword. Decrementing ESP increments the size of the stack because the base of the stack is actually at a high memory address compared to the top of the stack. What does this actually do ? It saves the base pointer onto the stack then sets the base pointer as the current stack pointer (address of top of stack) so it will change the address of the base of the stack. This means the program now has a new reference point for data on the stack. So they are telling us they want us to bruteforce the correct serial, and also that there is more than one valid serial. 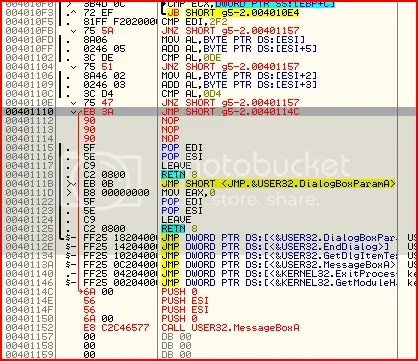 And to check whether our’s is right, we should put it through a MD5 (Message Digest 5) hash. In case you’re unfamiliar with MD5 hashing, simply think of it as a function where you can supply an input, and the output of the function is a 128 bit (32 character long) hash value. EAX holds the number of characters fetched. This value is compared to 6. If it is equal, we jump to 401076, otherwise 0 is moved to EAX and we jump to 401083. Let’s follow the latter first. 401083 is a compare of EAX to 1. However our serial was not 6 characters long so 0 was moved into EAX. 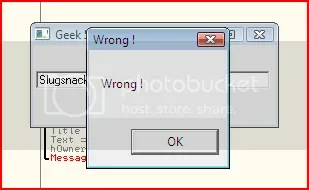 There is then a JNZ (jumps when EAX does not equal 1) to 40109D and that is a call to a “Wrong !” message box. So already we know that our serial needs to be 6 characters long. Now let’s look at what happens when it is indeed 6 characters long. So after the serial is loaded to EAX, that is pushed onto the stack and then 4010D6 is called. After the call, EAX is compared to 1. 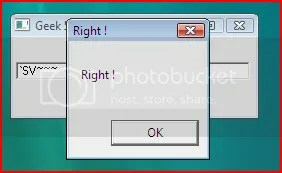 If EAX is equal to 1, then we continue to the “Right !” message box. 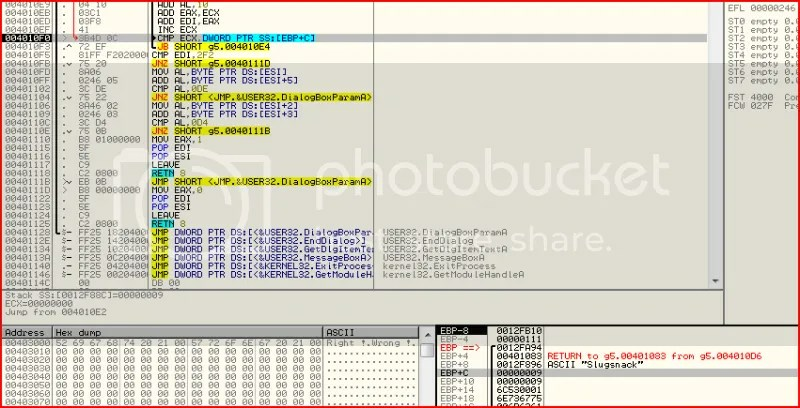 You should be familiar with this kinda structure now where there is some sort of serial checking algorithm which then sets EAX to 1 or 0 if the serial is valid or not respectively so we won’t “re-invent the wheel”. You may be wondering why I’m not even bothering to look at the check algorithms. The reason is, if you look at each of those algorithms, it’s pretty clear that it’s not just a case of reversing the instructions to get the correct input, hence the objective being bruteforce. No need to explain this really, it’s clear we don’t want to take that jump and we want to go to 401110 instead. Perhaps you’re thinking, why not just negate those jumps or NOP those checks and go straight to the “MOV EAX,1”. Simple, we were asked to bruteforce a serial. If we just patch the application, there is no way of finding a working serial. So I am thinking now of a few ways of bruteforcing this application. I could simply write an external application to do it for me and just copy the check algorithms over. But I’m not here to teach you how to program so I’ll show you how it can be done with inline patching instead. So how would we go about bruteforcing in the first place ? Typically, we would want to test every single string from the bytes “00 00 00 00 00 00” to “FF FF FF FF FF FF”. However, a lot of those bytes can actually be discarded since even if they are a working serial, it is unlikely they would be the one we are looking for since they aren’t in the “typable” part of the charset. For example, one of the characters of the serial would definitely not be 0x9, horizontal tab. I can safely say the serial is somewhere from 0x21 to 0x7E inclusive. This is not the same as the bytes “20 20 20 20 20 20” to “7E 7E 7E 7E 7E 7E”. Why ? Between those bytes, there are values such as “20 20 20 20 00 20”. We have already decided we don’t even want to bother wasting clock cycles on bytes from 0x00-0x19 and 0x7F+. The way I am about to propose is by no means the best or optimal way of dealing with this problem but it is a simple solution that I devised hoping it would be easy to understand. I intend to treat each of the 6 bytes of the serial as separate numbers. We want to try every combination of these bytes where each bytes is 0x20-0x7E. Let us first look at what happens when we count in decimal. First, in the units column, we increment until we reach 9. What happens then ? The tens column is incremented and the units column set back to 0 and then incremented to 9 again. This continues until the tens column reaches a value of 9. The hundreds column then is incremented and the tens and units column reset.. and so on. So the section we have been looking at so far has been the .text section. So all seems fine, its virtual size is 14C which rounded to the nearest multiple of the alignment (200h) is 200h. But hang on, what was the address of the last item on the JMP thunk table ? It is 401146 and we start having free bytes from 40114C. So we are able to write (200-14C) B4 bytes. That isn’t really enough for a big patch like the one I am proposing. The first solution is much harder than it sounds. I won’t go into the details but try and fiddle with it yourself if you like. The easiest option by far is method 2. To add this new section, I used CFF Explorer (easily googled). Save the new executable somewhere under a new name, take care to put the file extension .exe since CFF Explorer doesn’t always save it as that format. Let’s first think of an algorithm for the incrementing part. So what we want to do is to increment each byte then check whether (starting from the last byte although technically it doesn’t matter) its value exceeds the 0x7E and if so, set it back to 0x20 and increment the next byte up by one. So now I need some code for the MYPROC label. That is, what gets executed every other time than the first. This means I won’t continually push EDX and mess up the stack and I can change the string at [ESI] instead of just moving a static value to it. I won’t patronise you by explaining all that, it’s pretty simple. However, before we do this, I have a little trick. I figured since we’re not even going to use the patched application except to find the serial, we don’t need to leave all the ends tidy, such as returning EDx’s value, making sure the stack is valid, etc. Our patched application will run perfectly in Olly of course but it will also run much slower than by itself. That is the reason I made a new section. Our massive algorithm could’ve been put into .text and it would’ve run fine in memory but we wouldn’t be able to save. However, if you check that string’s MD5, it does not match with the requirements. So although it meets the criteria the application sets, it does not meet the criteria of the ReverseMe, that is the MD5 hash has to be 96c4dda0c4a0b34262b1d91d47056f9e. Either way, you should get the idea now 😉 Thanks for reading, see you next time !